I’m Ed Smith a Sacramento Salmonella Lawyer. Salmonella is a bacterium that causes salmonellosis, which is a type of food poisoning. It is estimated that about 1.2 million illnesses and 450 deaths occur each year due to salmonella poisoning in the United States. While salmonella poisoning typically results in a diarrheal illness called acute gastroenteritis, which can include stomach cramping, bloody diarrhea, fever, nausea, and vomiting, when the infection spreads beyond the intestinal tract, complications, and even death may occur. The most severe salmonella infections are likely to occur among young children, older adults, and people with weakened immune systems. As mentioned above, symptoms of salmonella infections usually include those that are associated with acute gastroenteritis. While most people who become ill from salmonella will recover completely, oftentimes, it takes several months for bowel habits to return to normal. In other cases, repeated diarrhea and vomiting can cause dehydration, which can be severe in young children and older adults, and may require hospitalization. In addition, it is also possible for a salmonella infection to spread to the bones, joints, bloodstream, brain, the nervous system, or other internal organs where symptoms then become associated with that body system or body part. In these cases, the salmonella infection has become invasive. Invasive salmonella infections can be severe, have long-lasting health effects, and can potentially be life-threatening. Invasive salmonella can present itself as illnesses like meningitis, septic arthritis, and blood and bone infections. While most salmonella infections are simply treated with rest and rehydration, serious infections may require hospitalization and treatment with antibiotics. Unfortunately, some salmonella bacteria are resistant to antibiotics, and in these cases, the drugs used in treatment can be more toxic, less effective, and very expensive. 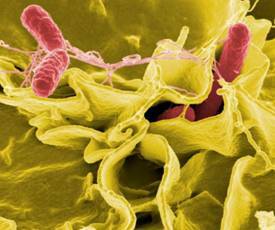 What Are Sources Of Salmonella Infections? Salmonella bacteria live in the intestinal tracts of animals and humans, and salmonella infections are typically caused by eating food or drinking water that is contaminated by animal feces. Foods that are most often contaminated by salmonella include poultry, beef, eggs, milk, or fish, but any food can be contaminated, including fruit, vegetables, or processed foods. Salmonella can also infect if contaminated food is not handled properly in the kitchen. Raw meat juice that drips on other foods or food preparation surfaces is typically a cause of salmonella poisoning. In addition, it is also possible to contract salmonella poisoning by touching infected animals and not thoroughly washing your hands afterward. In most cases, animals that carry salmonella look perfectly healthy, but the bacteria can spread if one comes in contact with the animal’s feces. While reptiles are most likely to carry salmonella, even backyard chickens can infect someone. It is also possible to pick up salmonella from an animal’s body, whether that animal is covered in fur, scales, or feathers. That’s why it is extremely important to wash your hands after handling animals in settings like petting zoos. As mentioned above, salmonella poisoning can occur anytime you come into contact with contaminated feces, whether the feces are on food you consumed, or on an animal you petted. In most cases, a salmonella infection will clear up in five to seven days; however, in other cases, an infection can be severe, invasive, and can cause serious complications and even death. Treatment for a serious salmonella infection can oftentimes be lengthy and very expensive, not to mention it may take a long time to recover fully depending on the complications that occur. Fortunately, successful litigation against those who are found responsible for salmonella outbreaks, particularly in the food service industry, has helped many salmonella poisoning victims at least pay for the extensive and expensive treatment they have endured. I’m Ed Smith, a Sacramento Salmonella Lawyer. If you or a family member has been seriously injured or killed due to food poisoning, please call me today at 916.921.6400 for free, friendly advice. Please check out our reviews on Yelp, Avvo, and Google. 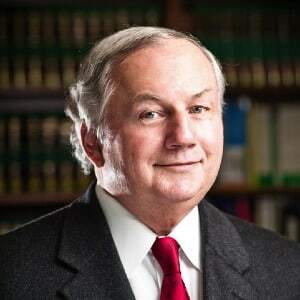 Practicing Personal Injury Law and Wrongful Death exclusively since 1982.